Documents leaked from the office of Eugeny Prigozhin’s political consultants show Russia’s strategy for intervention in African politics — to incite anti-Western sentiment and revive old territorial disputes. Meanwhile, Russian expansion is hampered by three obstacles — unprofessionalism, corruption and alcohol. The demonstrators silently carried posters demanding that Madagascar be liberated from French influence. About thirty people walked the streets of Antananarivo and stopped in front of the French Embassy. The rally would have ended in silence, if not for the initiative of a tall, well-built man. He began to chant demands, such as “Paris must return the Scattered Islands!” referring to the disputed territory in the Mozambique channel. (*The Islands are under French rule; Madagascar, which gained independence from Paris in 1960, does not formally make territorial claims, but the goal of transferring the islands to Madagascar is in the platforms of many nationalist candidates*). The offshore zone near the islands is rich in minerals, estimated at up to 12 billion barrels of oil, and up to 6 billion cubic meters of gas. The man who led the crowd in front of the Embassy is not even a Malagasy citizen. 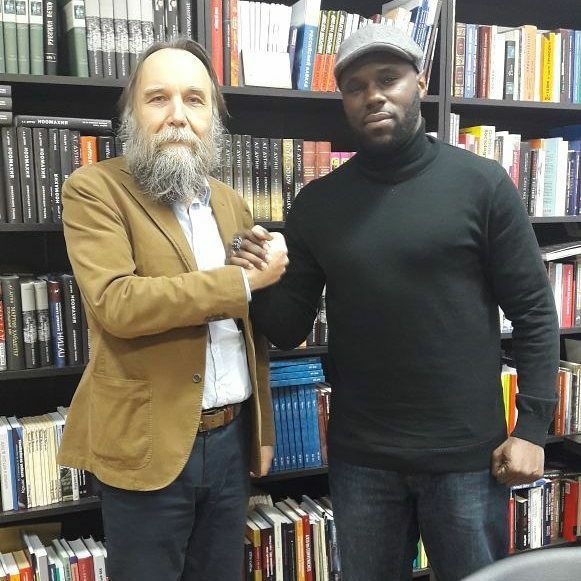 He is Kemi Seba, whom supporters call a pan-Africanist, and some journalists and researchers call a black racist and anti-Semite. The day before the demonstration, he spoke at the Islands of Hope Conference at the Asia and Africa Hotel in Antananarivo. “France, get out of our territory, you have no right to be here! Africans trust Russia more than America or France!” he shouted from the rostrum. “We do not need the permission from the West to reclaim lands that are rightfully ours. Freedom of Africa or death! 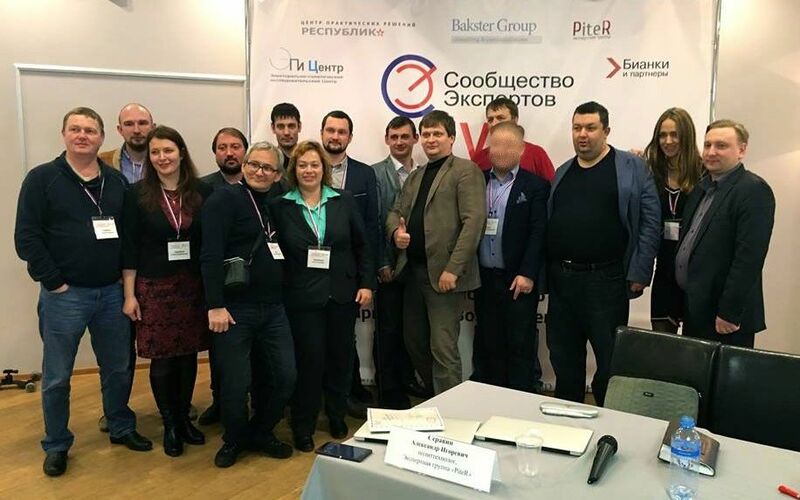 We will win.” This conference, as The Project found out, was organized by Russian political strategists who worked for Eugeny Prigozhin, a shady businessman, who fell under U.S. sanctions for his interference in the US presidential election. Prigozhin’s team also paid the demonstrators in front of the French Embassy. Russian specialists have been cooperating with Seba since at least mid-2018, say two political strategists working in Africa. Prigozhin’s participation in African politics is no secret (The Project has already covered the presumed Russian involvement in the Madagascar elections). But the scale of Prigozhin’s plans has recently become clear, since The Project obtained internal documentation of a “back office” in the African project — an informal analytical center under Prigozhin’s command. (The Project is not publishing all the documents for security reasons for our sources. The authenticity of the documents was confirmed by two political strategists working in Africa, and by a member of the “back office.” Separate information from these materials was also confirmed by two Malagasy people who helped political strategists in Madagascar. Some of the information was verified with the help of information provided by the London-based non-profit organization “Dossier” established by Mikhail Khodorkovsky). The “back office” has about 10-15 employees. But the number of employees often changes, according to our source, who is familiar with the organization and its work. The operational head of the “back office” is political analyst Peter Bychkov, according to two political strategists who have worked with him. Initially, Bychkov agreed to talk to The Project, but then stopped responding. The list of States where Prigozhin has interests includes 39 countries, and Prigozhin’s political advisers are working in at least 20 of them right now, The Project calculated, based on information contained in documents of the “back office.” This interest in Africa is even reflected in official statistics. Since 2017, the number of Russians visiting African countries increased significantly — by more than one and a half times, according to data from the Russian border service. 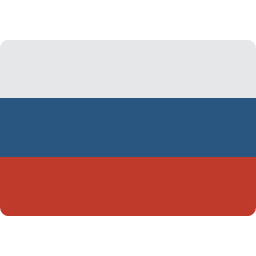 Russian advisers in these countries maintain a direct connection with Prigozhin. They each carry a special phone so that Prigozhin can call his subordinates. Phone numbers are in order, from number “1” (assigned to Prigozhin), to at least number “700,” says a political strategist who worked in Africa, confirming his colleague’s statement. Each country has its own plan of action, but the most developed part of the strategy concerns the former French colonies in Africa, and is related to Kemi Seba. A basic principle of Russian foreign policy on the continent, as posted on the Russian Ministry of Foreign Affairs website, is “African problems, African Solutions.” Seba, at 37, best fits this formula. He is the son of immigrants from Benin, who grew up in France, and then returned to Africa. The press has repeatedly called him anti-Semitic, a “black racist,” and a supporter of kemetism (a reconstructed polytheistic religion, which extols the role of the black population in the formation and development of civilization on the planet). His organization, “Tribe Ka” (Tribu Ka), almost staged a Jewish pogrom in Paris. Then Seba converted to Islam and joined the “New Black Panthers,” who are anti-imperialists and pan-Africanists. 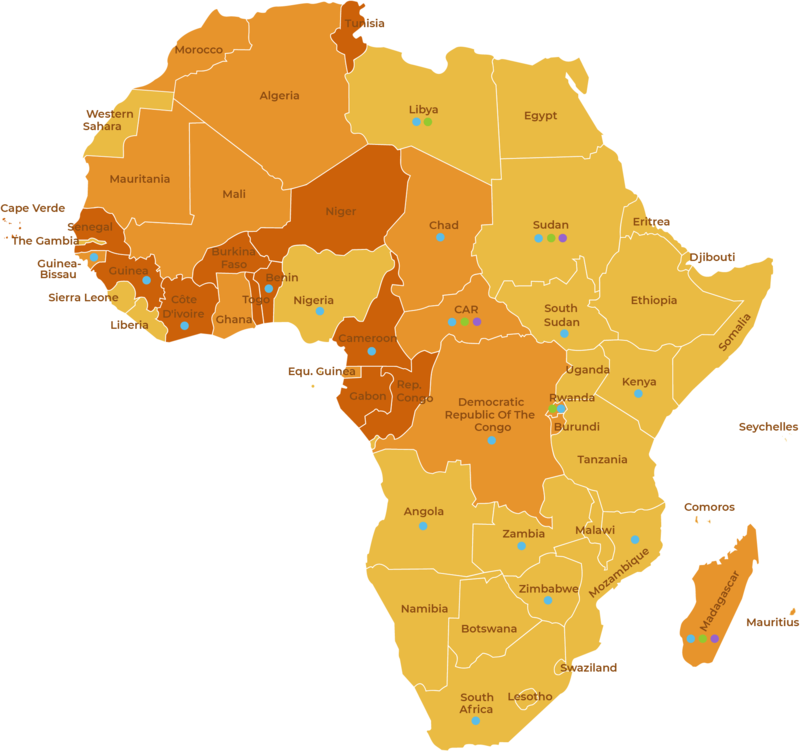 The Pan-African Project assumes that one day an “African Empire” will be established on the continent. To this end, political consultants must help their candidates win elections in several countries so that they recognize the power of one leader. The role of such a leader, at least in French-speaking Africa, claims Seba, follows from leaked documents. Seba’s press secretary did not reply to The Project. “African Empire” calls for the creation of regional offices of the Kemi Seb Movement throughout the continent. At the moment Urpanaf is represented in 12 countries. Russians started to work with Seba soon after he visited Moscow in December 2017, at the invitation of political scientist Alexander Dugin, known for his conspiracy theories. For Seba, cooperation with Prigozhin’s strategists was beneficial. He received not only a platform for his speeches, but also money for participation in the conference, says Malagasy, who worked with a group of political strategists. The West has lost the right to divide people between full-fledged citizens and those whose lives are insignificant, and to teach other countries — so in the documents of political strategists justified the struggle of African countries with the “old colonial power — France”. The priority direction for Prigozhin’s people is to work in the countries where elections will be held in the next two years. Their methods of struggle include criticism of neocolonialism and the African franc zone, “as an instrument of economic colonial enslavement of African countries.” Seba has already succeeded in this direction: he has been fighting the franc since at least 2017. 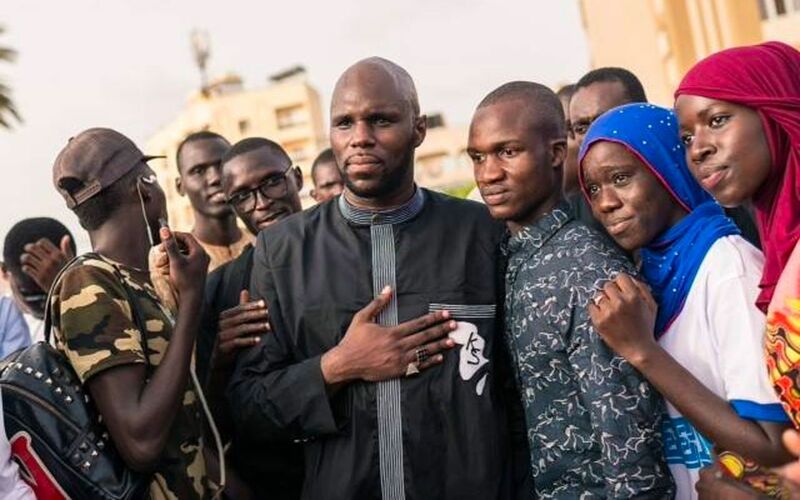 Last August, in Dakar, he publicly burned a banknote of five thousand African francs (slightly less than eight euros), for which he was expelled from Senegal. Another struggle is for the “fair resolution of territorial disputes,” which means the struggle for disputed land. Seba did this in Madagascar, where he participated in a conference on the Scattered Islands. 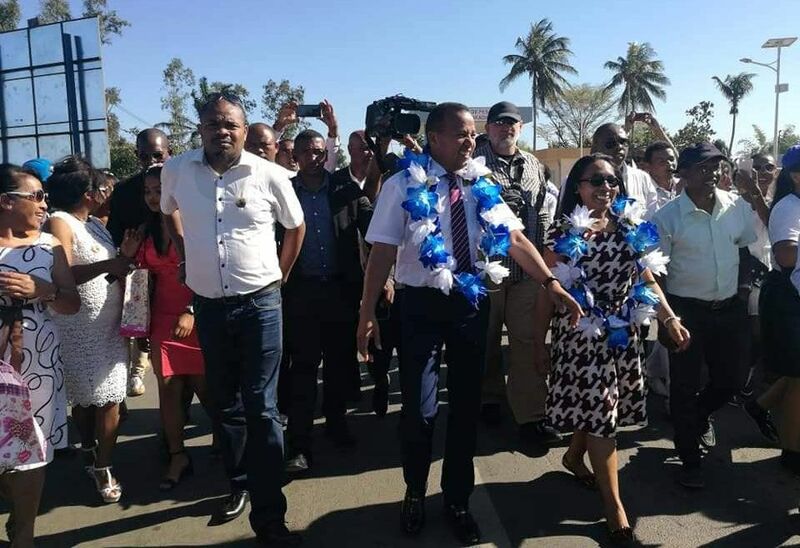 On this trip, Seba was accompanied by a Russian-speaking lady, to whom Malagasy activists reported on the preparation of the event, said a Malagasy source, who worked with a group of political strategists in Madagascar. 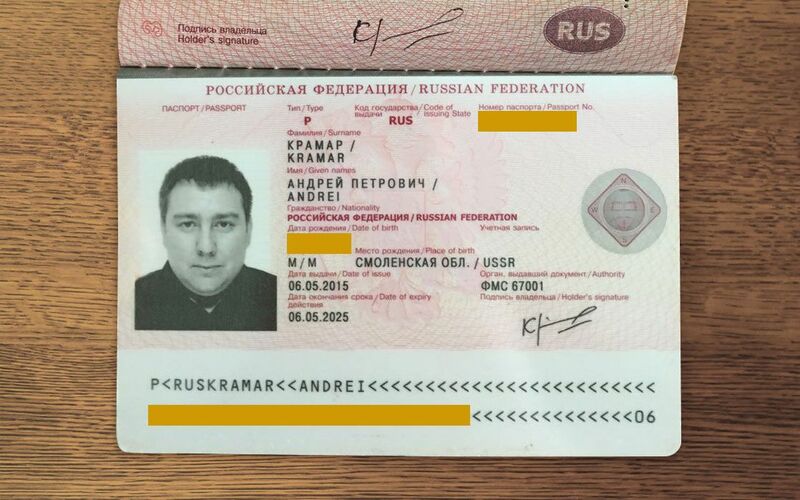 The organization of this conference and even a meeting of foreign guests, according to one of the documents, were assigned to Russian political strategists Roman Pozdnyakov and Andrei Kramar. They also organized the economic forum, which was held in Antananarivo in August 2018, and which was also attended by Seba. Pozdnyakov and Kramar did not answer The Project. 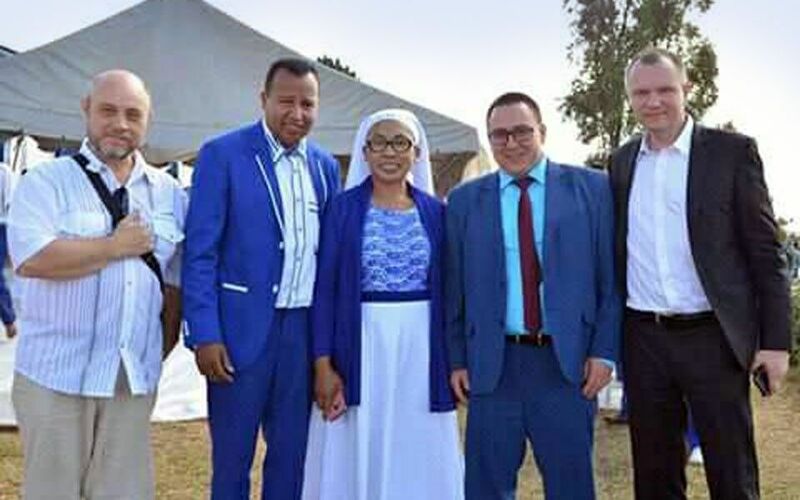 Pozdnyakov and Kramar, who were on the island of Madagascar since May 2018, also oversaw project “Pastor,” which assisted the founder of the Malagasy Church of the Apocalypse, Andre Christian Mailhol, in his campaign for president, according to the materials of political strategists. This information was confirmed by two Malagasy sources, who worked with Russian political strategists. For example, Russians organized the following campaigns for Mailhol: “The Fight against bubonic plague,” “Good deeds/miracles of the pastor,” “Distribution of rice through the network of the Church of the Apocalypse.” But they all failed, and the pastor scored less than 1.5 percent of the vote, according to one political consultant, on condition of anonymity. In Madagascar, a group including Roman Pozdnyakov (first from right) and Andrei Kramar (second from right) not only helped pastor Andre Mailhol. Pozdnyakov offered his colleagues local girls to marry, in order to obtain citizenship and buy land, says a political strategist who worked in Africa. Some of them, like translator Vladimir Boyarishchev (left), followed their advice. The official organizer of the conference in Madagascar was the Association Afric — a small publication that covers African politics. The name of the organization is an acronym from the Association for Free Research and International Cooperation. Afric presents itself as a community existing on anonymous donations. The Association does not appear in the available registers of legal entities. The name of the site owner is hidden, the webpage was registered in April 2018. 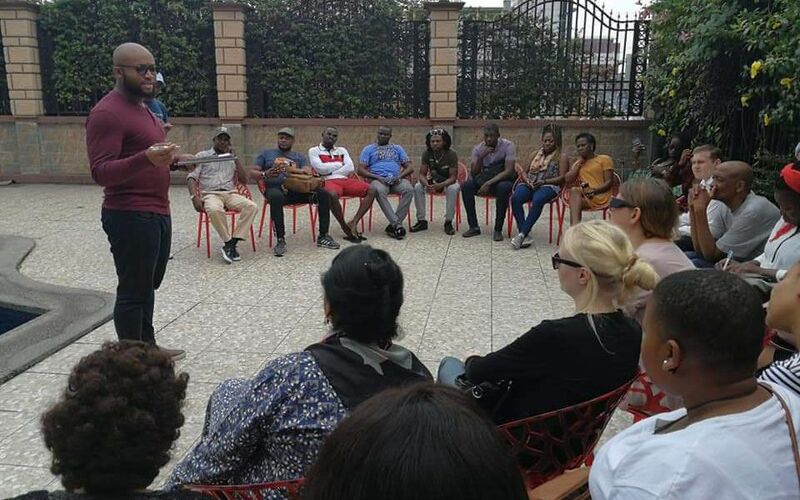 Among the representatives of the Association is an employee of the St. Petersburg “back-office,” Yulia Afanasyeva and her friend, a native of Cameroon and a graduate of the Belgorod Technological University in Russia, Michael Cheuva. In Russia, Afanasieva also manages the Center for Social and Cultural Initiatives, which includes among its co-founders the head of the “back office,” Bychkov. Afanasieva did not answer questions from The Project. Observers from Afric visited the elections in at least two other countries — in the Democratic Republic of the Congo and in Zimbabwe, where the first President was elected last year since Robert Mugabe’s 30-year rule. Emmerson Mnangagwa, the ruling party’s candidate, won the election, and the opposition said shortly after the vote that Russia had interfered in the election. Although the new head of state rejects these charges, political strategists associated with Prigozhin allegedly participated in the election campaign, says one of Prigozhin’s consultants. Pozdnyakov now works as a head of the trade Union of workers of small and medium businesses of the self-proclaimed Donetsk Republic (DPR). His wife heads the DPR Central Election Commission. In each country, where there are people of the “Kremlin Chef”, the tasks and scope of work vary greatly. In some countries, the lead role is played by military mercenaries. In others, there are only political strategists (as in the DRC and in Zimbabwe described above). In the third, in addition to those and others, Prigozhin already has business interests. Valery Zakharov, the Russian security adviser to the President of the Central African Republic arrived in Rwanda in early January 2019. Dmitry Utkin, better known for his nome de guerre “Wagner,” was supposed to fly with Zakharov, but at the last moment his trip was postponed, The Project was told by a political strategist who worked in Africa, and whose story was confirmed by a former mercenary. Both men work for Prigozhin. In Chad and Benin, Prigozhin’s people interact with politicians close to the armed Muslim group “Seleka,” according to a source familiar to “back-office” and confirmed by the political strategist who worked in Africa. Political strategists are accompanied everywhere by armed men associated with the Wagner group or Russian Special Services. For example, in Madagascar, the protection of one of the presidential candidates was charged to a Russian man named Konstantin (pictured on the right behind a candidate, with glasses and a baseball cap). Everybody called Konstantin “The Colonel,” said the Malagasy source, who worked with a group of spin doctors. In South Africa, Russian political strategists plan to support the ruling party in the elections in the summer of 2019, according to a presentation prepared by political strategists. 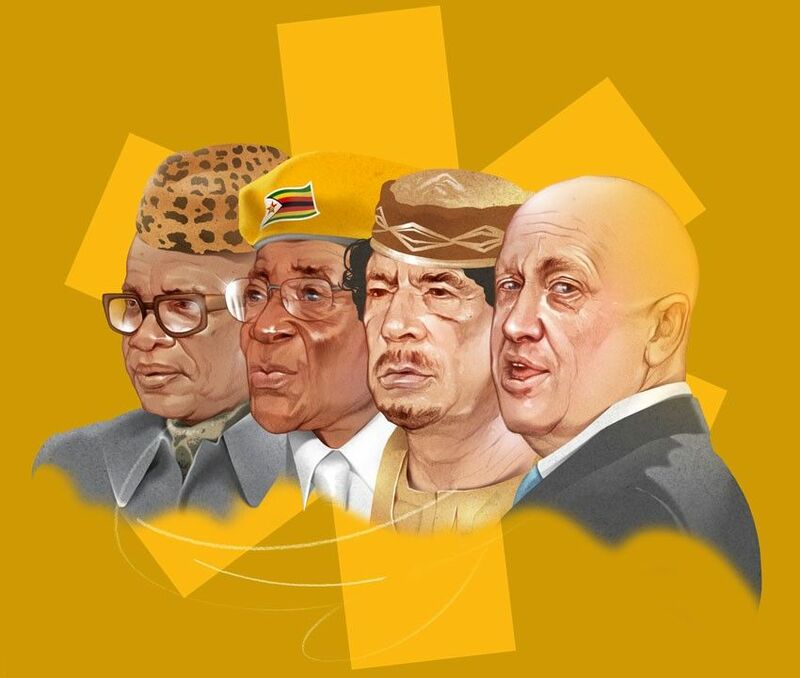 A copy of it was provided to The Project by the center “Dossier.” In Zambia, Prigozhin’s people are engaged only in sociological research, since the elections are scheduled for the summer of 2021. In February-March 2019, experts conducted 12 focus groups, and the results were sad for current President Edgar Lungu. Respondents spoke about him as a “pathetic,” “weak leader” and an “alcoholic,” according to a report on the study, a copy of which is available to The Project. Working in Africa is not cheap. The Project has documents that show a complete assessment of investments in the Madagascar presidential campaign and in payment of mercenaries in the CAR. We can assume that the entire African adventure costs several times more than those figures. Source: salary list from the “back-office,” data provided by the center “Dossier. In Russia, at least two specialists were engaged in accounting. One of them,Valeria Darovskaya, was responsible for accounting in the “back office,” according to documents obtained by The Project. Darovskaya confirmed that she was familiar with Bychkov, the head of the “back office,” and worked with him, but claims that she was a psychologist, not an accountant, and her work was not related to Africa. She did not answer other questions. The second accountant, Yana, helped political strategists receive money at a cash desk in the center of Moscow, near Taganskaya square, the political strategist working in Africa told The Project. The phone number where Yana can be contacted belongs to Yana Galkina, The Project established. Galkina presumably is an assistant of Alexander Kuzin, who worked in companies related to Prigozhin. Prigozhin is at the forefront of Russian politics in Africa, but official Moscow shows no less interest in events on the continent, in the same countries where the restaurateur’s subordinates work. So, Russia will hold a summit on Africa in Sochi at the end of October. State Duma speaker Vyacheslav Volodin recently met with African ambassadors. And the previous President of Madagascar, Erie Radzaunarimampianin, who worked with Prigozhin’s people, visited Russian last spring and met, in particular, with the head of the Federal Agency for Youth Affairs, Sergey Belokonev. Sergey Belokonev (pictured first from left) and the President of Madagascar were accompanied by the advisor to the rector of RSU. A. N. Kosygin on youth policy Andrey Kostyukov (fourth from left), a good friend of many of Prigozhin’s political strategists. 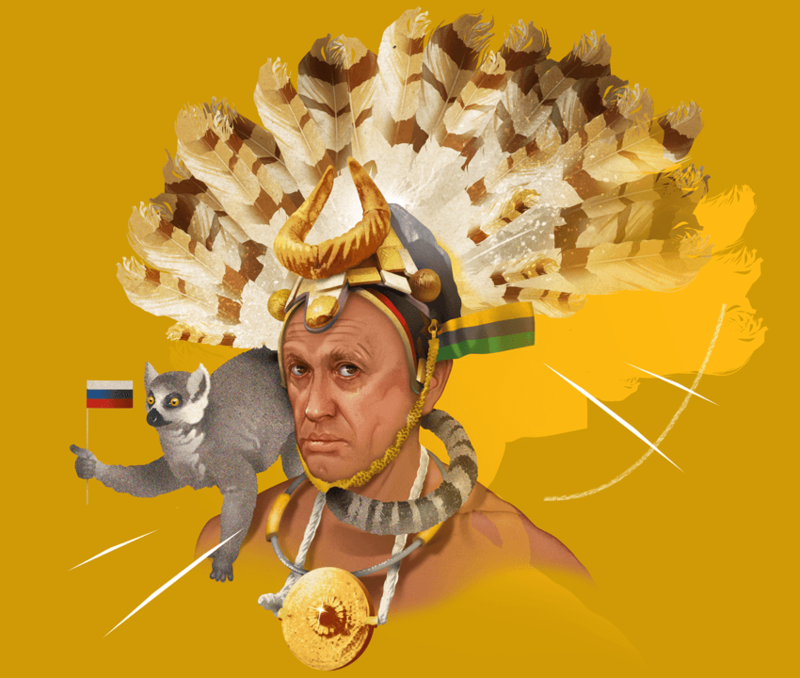 Since 2018, Russia has signed eight different agreements with the countries in which Prigozhin’s people work. Of these, four relate to military cooperation. There is no doubt that Prigozhin’s actions in foreign policy were agreed to by Putin, a high-ranking Russian politician told The Project. There is also coordination at a lower level, with the Department of African foreign Ministry, adds one of Prigozhin’s analysts. 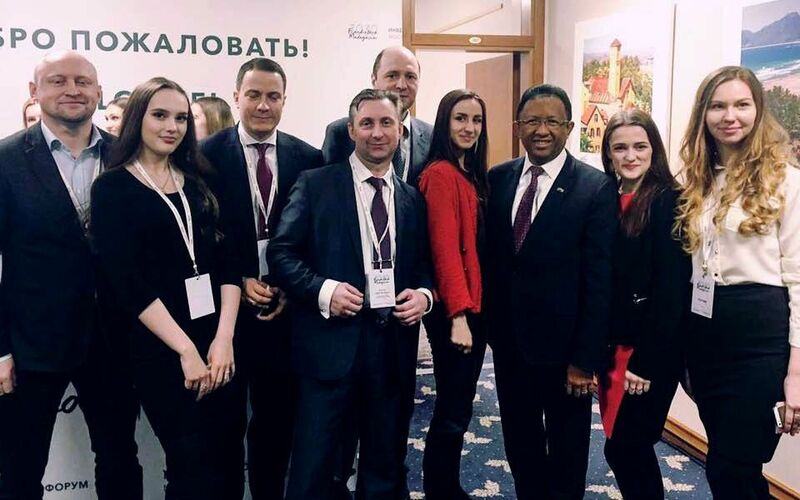 Russian diplomats took the former President of Madagascar to Moscow to an economic conference, also attended by Prigozhin’s political consultants. Presidential Spokesman Dmitry Peskov said that Vladimir Putin does not know about Prigozhin’s activity in Africa. Foreign Ministry spokeswoman Maria Zakharova told the Project that she didn’t know anything about it. Work in many of these countries is ongoing. However, despite the high costs, ambitious plans and a large number of political strategists working on African projects, the effectiveness of the entire campaign is low. This is understood by Prigozhin’s people themselves, reporting to St. Petersburg about the problems, according to documents of the “back office.” The reasons are poor coordination with the Russian office, embezzlement of allocated money, and low qualification of employees recruited mainly from former members of the movement “Nashi” (this movement was partially described by The Project in Part one of this story). A separate complaint is heavy drinking among employees.